Grades VIII, IX and X follow the NCERT curriculum. High school forms the very foundation on which further education and careers are mapped out. Hence, our programmes, courses and resources are devoted to helping our students achieve academic excellence, compete and perform to the best of their ability, plan their futures and connect to the world in meaningful ways. A typical classroom at Senior section at Deens is a vibrant and enriched learning space. What strikes you at first glance is that our class sizes are intimate – restricted to a small group of 30 students and 5 sections. Every day begins with circle time: Here the teacher discusses with the children Life skills and values which need to be reinforced time and again to ensure good behaviour and attitude in children. The academic session is divided into 2 terms and there are 2 formal reviews within each term. There is a system of continuous assessment, with a fine loop of feedback, ensuring that the child is building up on his skills and knowledge. Assessments vary in nature, from simple paper pen tests, to oral, to presentations, etc all of which tie in critical thinking skills, scientific skills, problem solving skills and life skills and positive attitude and values. Feedback is regular and parents are encouraged to meet with the facilitators to create a structure for students to develop skills of time management, organisation, study habit etc which will lead to enhanced holistic development of their child. 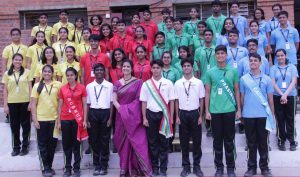 The Students of grade 8 in association with Rotary Club Whitefield conduct club activities on Thursdays during school hours. The aim of this club is to provide exposure to the students to various social and environmental issues and to explore solutions along with the senior members of the mentor Rotary Club.